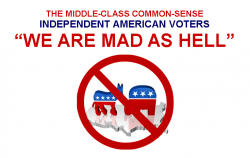 INDEPENDENT AMERICAN VOTERS WHO WANT TO CRASH THE PARTIES! There will be one AVR District Representative in each Congressional District in every state. There are 435 congressional districts in the United States; therefore we will eventually have the same total number of AVR District Representatives. We need people who are truly interested in political and governmental reforms and will devote the necessary time and energy to develop the voter coalition in their respective districts. Also, to be a district representative, you must reside in the congressional district that you want to be the AVR representative in. You need to be a registered voter because if you are not a registered voter you can not have much interest in truly working to institute reform measures in our corrupt and over grown government. It is critical that you be knowledgeable and highly skilled in these social media; Facebook, Twitter and Google+. This will be critical in contacting and recruiting potential coalition supporters. There will be quota’s that AVR Reps will be required to meet in order to maintain the position. AVR district representatives will operate as independent contractors to EPU, Inc. d/b/a The American Voter Revolution. AVR does not have membership dues or fees and we will be totally dependent on contributions from supporters of the voter coalition. AVR will split any and all contributions 50% – 50% that are made in the AVR reps congressional district. That includes any contributions that are made in that district whether the representative had any thing to do with it or not. We want the AVR representative to be successful and make enough money to pay all of the district expenses and still leave enough money to adequately compensate the representative for his or her time. If you are interested in being a AVR District Representative in your district, please click here and fill out the information form. Someone from the American Voter Revolution will be in touch with you soon. If you check on your state page on the AVR website, you can see if there is an AVR representative in a particular congressional district by clicking on the districts number by the State Seal in the middle of the page. If the link goes to a Facebook page, then there is already a AVR repreaentative in that district. If the link goes the to Congress persons website in Washington, DC, then that district is open and we are needing an AVR Representative. We want to eliminate the career politicians so we can reclaim our government of the people, by the people and for the people! We sick and tired of the politics as usual in Washington, DC and we DO NOT want a government of the special interest, by the corrupt representatives and for the rich and powerful; THE STATUS QUO HAS GOT TO GO! The most important thing that we can do is unite the AVR voter coalition and impose “VOTER SANCTIONED ONE TERM LIMITS” and eliminate the corrupt career politicians!